Assisted by its tendency to grow ahead of inflation over longer time periods, property stands up well to scrutiny when compared with the other major asset classes such as equities and bonds – in a number of global markets property has outperformed both of these asset classes over the longer term. 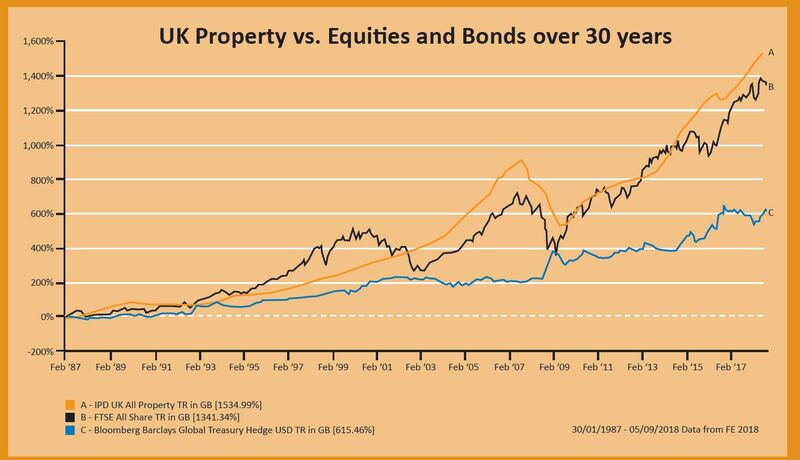 The chart below shows how UK property has outperformed over the past 30 years. It is Harvest’s view that property should be viewed primarily as a source of income and secondarily as a means of capital growth. Investing in property vehicles which can deliver reliable sources of income at attractive levels of return will lead naturally to the quality end of the property spectrum. In addition, because rents tend to move with inflation over the longer term, the levels of income redistributed to investors will also tend to grow over time. Of course, a growing level of rental income will in turn lead to capital growth. The Harvest Liquid Property Strategy involves taking an equal position across the three recommended funds. By doing so, the investors achieve exposure to total assets in the region of €1 billion as well as gaining a combination of Irish, European and Global real estate exposure. The average distribution yield from these funds is expected to be c.4% initially but should grow over time. In addition, while property as an asset class is notoriously cyclical, we would anticipate steady capital growth from these funds over the coming years. To find out more about the Harvest Liquid Property Strategy and to determine if it is suitable and appropriate for your portfolio please speak to your Client Advisor, call us on 01 237 5500 or email justask@harvestfinancial.ie. This marketing information has been provided for discussion purposes only. It is not advice, it is provided for general information purposes only and does not fully take into account your financial position, investment needs and objectives, attitude to risk, liquidity needs, capital security needs, capacity for loss, etc. It should therefore not be relied upon to make investment decisions. Prior to any formal investments taking place you will be provided with a detailed suitability letter taking into account all the above and outlining why the investment(s) are (not) suitable for you. Warnings: The figures refer to the past. Past performance is not a reliable indicator of future results. The value of investment(s) in the selected fund(s) may go down as well as up. If you invest in the selected fund(s) you may lose some or all of the money you invest. Past performance is not a reliable guide to future performance. Income may fluctuate in accordance with market conditions & taxation arrangements.